We started the SDFBI Bird Monitoring Project in 2014 to collect data that would show us how farmland birds are faring across the South Downs. The idea was to provide a much more meaningful measure of conservation success for our local area compared to the Regional Breeding Bird Survey (BBS) datasets. Three years on and the project is still going. In each of those years over 112 individual 1km squares have been surveyed by a team of volunteers, providing a great picture of how key species such as skylark, linnet and yellowhammer and faring across the South Downs. By way of a 'thank you', we ran a farm walk at the beginning of September to show those volunteers involved what you as farmers are doing based on the records they provide. 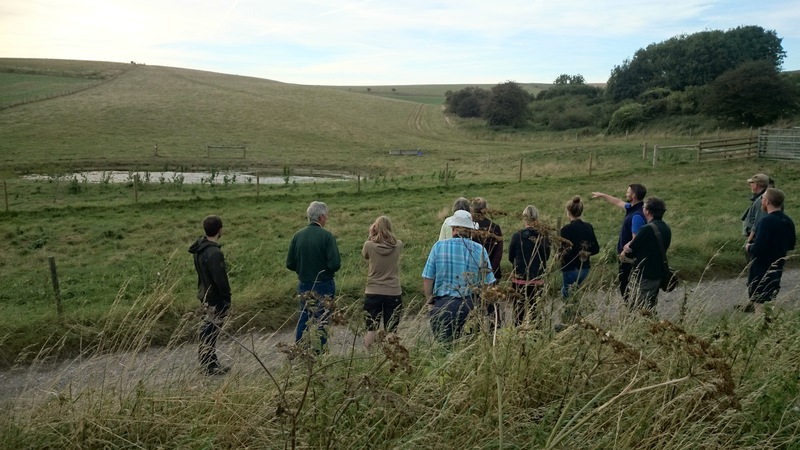 The walk was held on the Downs near Steyning, and was attended by a good group of people who have been undertaking the surveys. During the walk we saw a number of habitats created for farmland birds including beetle banks, conservation headlands and wild bird seed mixtures. For many it was the first chance they have had to understand what they were seeing in the fields, and how they are managed to provide feeding opportunities, nesting habitat and cover. For the Monitoring Project to be a success, it is vital that we can retain the support and enthusiasm of the people who undertake the surveys. Similarly, it is good for farming to showcase some of the great work that is going on across the South Downs, and to tell people how food production and conservation can go hand in hand. Following the success of the walk, we plan to run a number of events next year right across the Downs. If any of you would be willing to host a walk and perhaps come along to explain what you are doing for wildlife on your farm, we would love to hear from you.